The UFC has officially confirmed the remaining bouts that will precede the heavyweight clash between interim champ Shane Carwin and current champion Brock Lesnar. 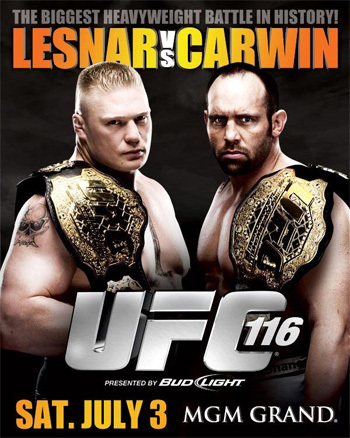 UFC 116 will emanate from the MGM Grand Garden Arena in Las Vegas, Nevada on July 3rd on pay-per-view. Tickets are currently on sale. Lesnar is set to make his return to the Octagon after nearly a year long hiatus to tend to a career-threatening bout with diverticulitis. He was originally scheduled to face Shane Carwin at UFC 106 this past November, but decided to pull out after falling ill and being unable to train. Carwin finally gets his crack at the title after solidifying his status as the No. 1 contender by dominating the new and improved Frank Mir at UFC 111 in March.